‘Psychogeography’ is one of those words that burned and sparkled like a roman candle for a while but has now gone on to signify a certain kind of literary grey goo. The author is generally a very earnest young man – sorry, flâneur – who’s keen to add a bit of gloss to a stroll round the ‘edgy’ but voguish part of London he’s just moved to. If he squints hard enough, the vape shop becomes a liminal zone, the five-a-side pitch is an edgeland and the shivering bods enjoying a gasper outside Wetherspoons are captive ghosts of deep time. And never, never forget that, by definition, 5,000 words are 10 times better than 500. 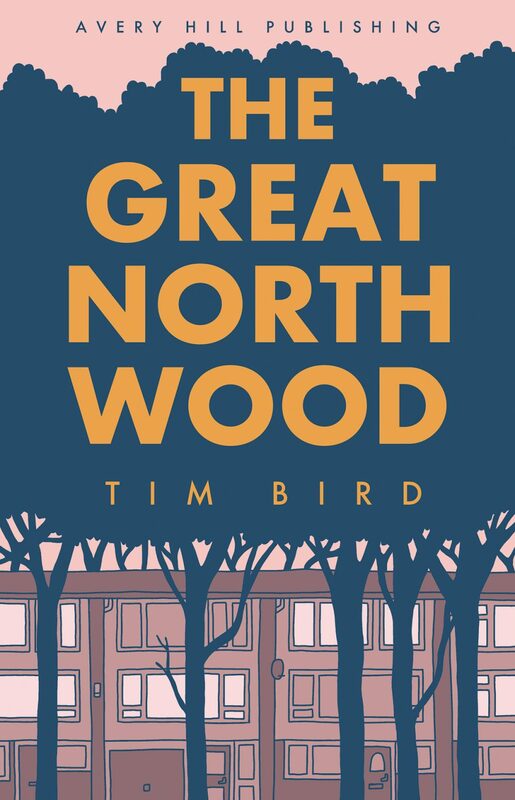 Anyway, the p-word pops up in the back-cover blurb for The Great North Wood, the eagerly anticipated new full-length work from Tim Bird, whose Grey Area series has indeed dealt with examinations of place, time and memory. Fortunately, Bird has a much more gentle approach to the concept, given further lift by the easy and accessible charm of his illustrative style. 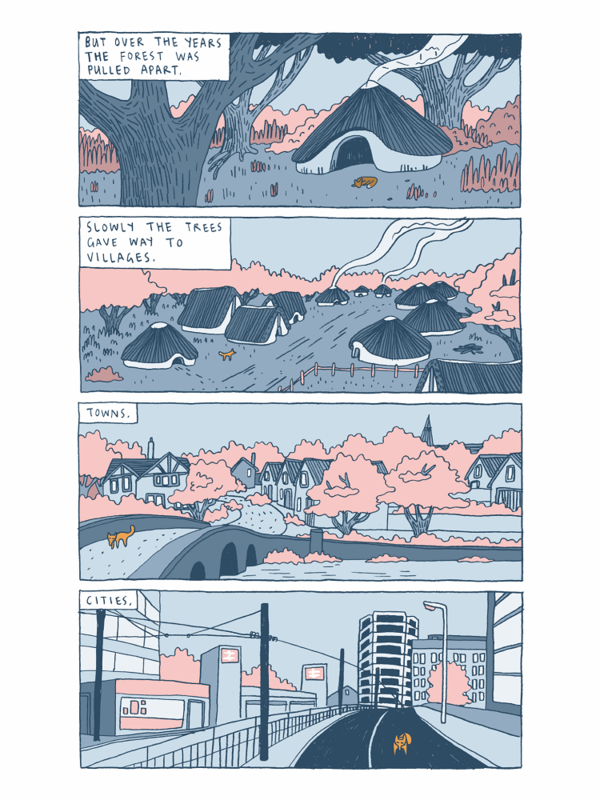 Of course you probably know all this already: his Grey Area: From the City to the Sea, tracing a thoughtful journey down the Thames estuary from London, won Best Comic at the 2015 British Comic Awards. The Great North Wood of the title is the ancient forest that stretched until recently across the hills of south-east London. Only a few patches remain, but its legacy is etched deep on the geography of the area; the house I’ve lived in for 24 years nestles neatly between South Norwood and Upper Norwood. Inside a lovely framing sequence, featuring one of London’s ubiquitous urban foxes as our guide, Bird takes us on a time-hopping tour of the area, tinged with poetry and fantasy. While looking more generally at the passage of time and the consequences of human activity, he also weaves in episodes of local history and folklore, both familiar, such as the unusual funeral arrangement of Margaret Finch, the Queen of the Gypsies, and less well-known; despite being buffeted nightly by the spirits of Penge Common, the legend of Ned Righteous was a new one on me. Bird also looks forward to a beautifully captured possible future in which the forest returns to claim its sovereignty over the ephemeral concerns of humanity. Bird uses his research and knowledge with a light touch. A lot of work in this idiom demonstrates a footnote-heavy desperation to squeeze in every possible factoid and piquant juxtaposition, like those Eggheads contestants who can’t resist the temptation to show how much they also know about each of the wrong answers. You even get the sense that, at 88 pages, there was still room for Bird to delve a little deeper without outstaying his welcome. Bird’s art style seems to me to be a little more relaxed and gestural than it was in his early work, and his use of a limited colour palette and cool, rhythmic layouts guide the eye through his pages with a lovely flow. The strong visual aspect of his work also eases the temptation to ape the sesquipedalian prose style of Sinclair, Self et al that often comes with this territory. 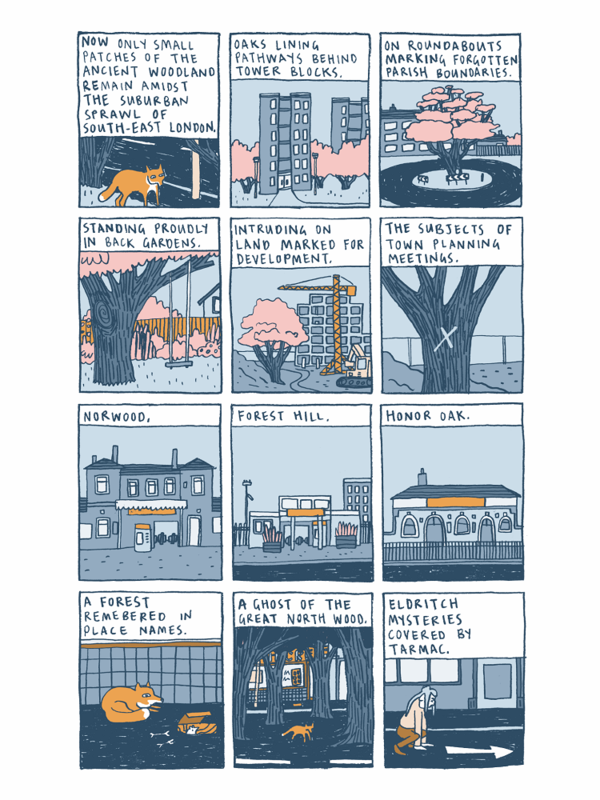 It feels like we never see enough work from Tim Bird, but The Great North Wood marks a very welcome return for one of the London comics scene’s more melodious voices. 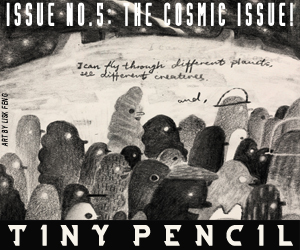 Tim Bird and Avery Hill Publishing are both exhibiting at ELCAF. You can find out more about Tim’s work on his website here and visit his online store here. You can also follow Tim on Twitter here and Avery Hill here.